Tech and Large Cap indices sit on the border between a bear market or a steep correction. While Small Caps have fallen into bear market territory, there is still a chance for other indices to come in from the precipice. The most bullish of these markers is Nasdaq Breadth metrics. Nasdaq Bullish Percents and Percentage of Nasdaq Stocks above the 200-day MA have dropped to levels last seen during 2011 lows. The relationship between new highs and lows in the NYSE is also building a head of steam. There is no clear marker for a low, but action here is approaching levels last seen during the worst of the credit crisis. The Transports are not quite there. The 2011 level has been breached, but it hasn't yet gone as far as 2009 levels. 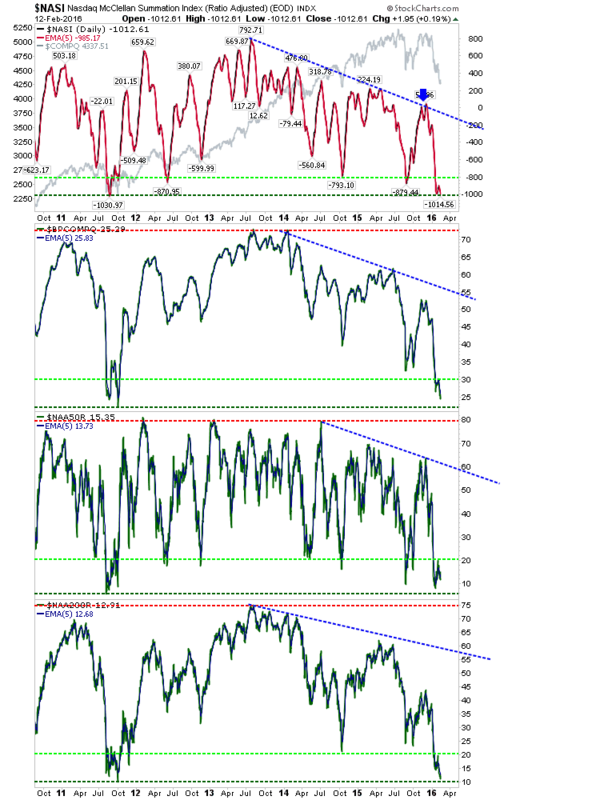 Technicals are showing clearer bottom markers than price action. The bear market Russell 2000 is approaching the measured move target from the head-and-shoulder pattern; it's above 50 points away as of from Friday's close. 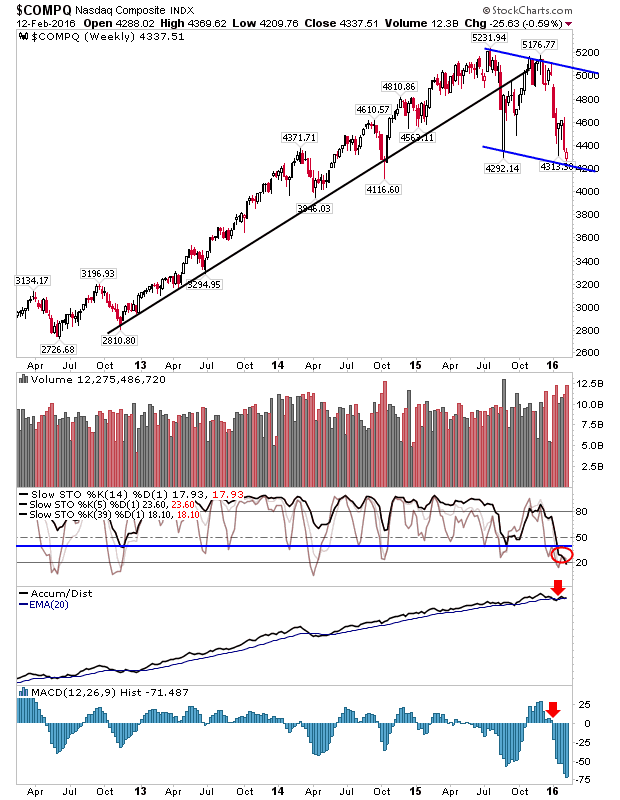 The weekly chart finished with a bullish hammer, so watch for a stronger close which may mark this week as the swing low week. . 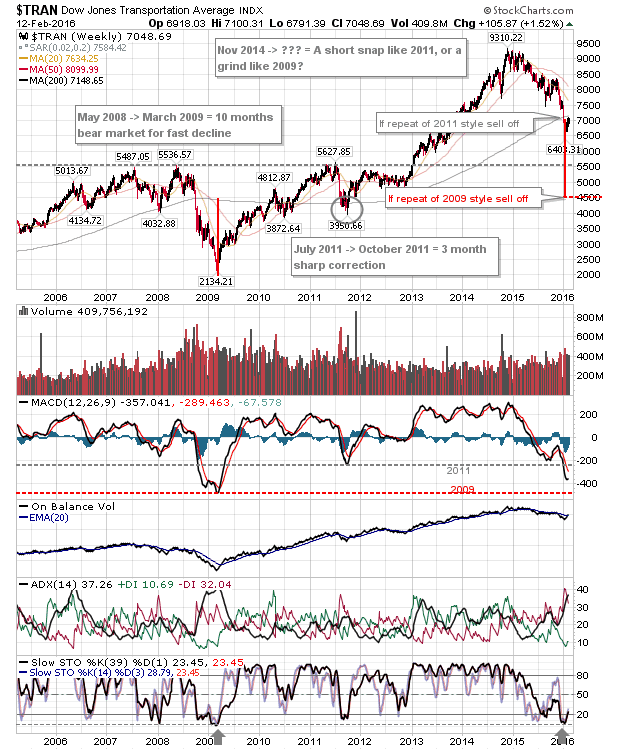 The weekly chart of the Dow has generated a number of spike lows around 15,550. If this level breaks, then it will be heading to 14,750. 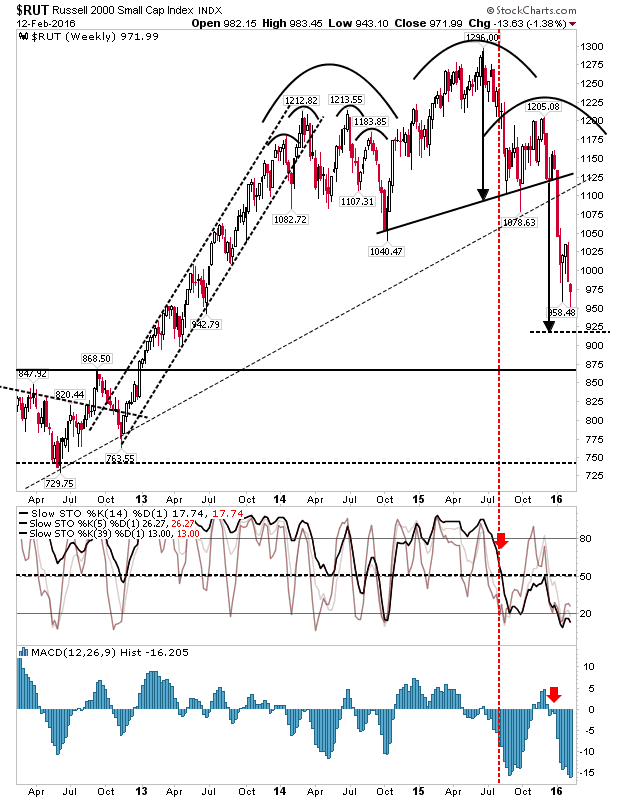 Stochastics are pointing to a bear market, but price action is holding lows. 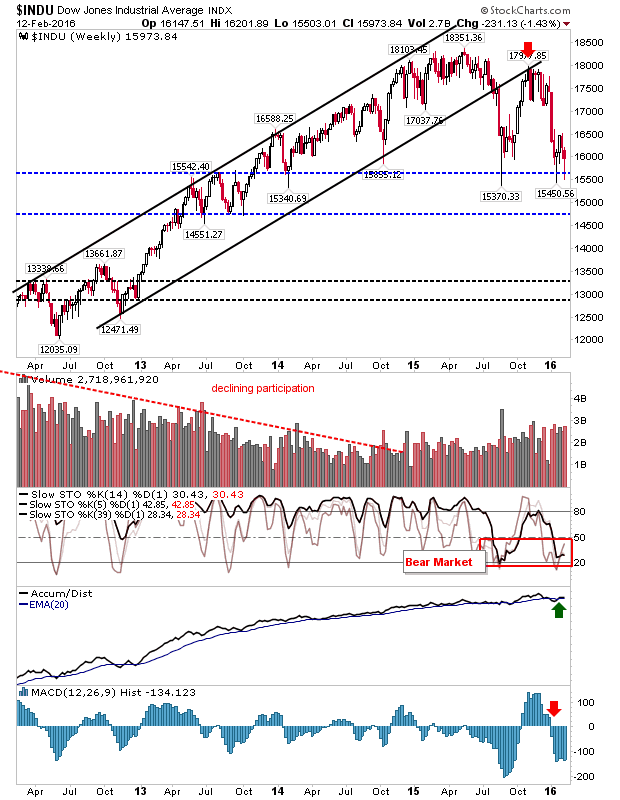 The Nasdaq may be shaping a downward channel, which if true, could be looking at a bounce back to 5,000. 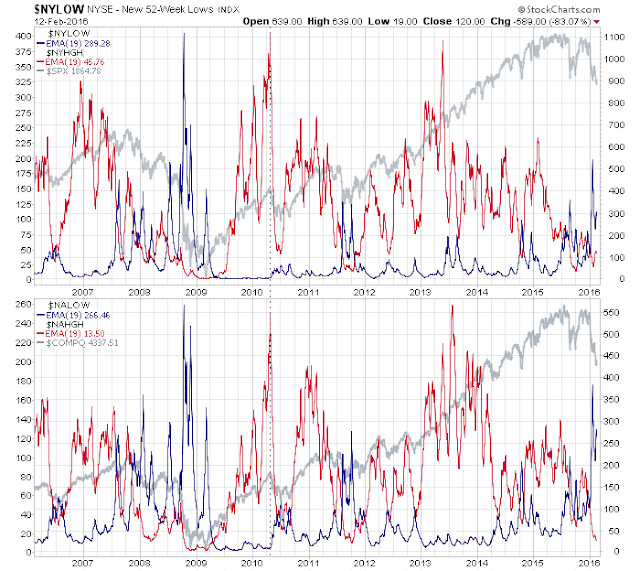 Techicals are deeply oversold. Monday is the start of a new week and a chance to confirm a low in the markets. Daily charts showed decent gains, albeit on light volume, but more will be needed if value buyers are to step in and take control.